SOP and MOP are the most common potash fertilizers used by farmers to grow crops. Here’s what makes them different from each other. As the world’s population continues to grow, so too do the number of mouths needing to be fed. As a result, it is becoming increasingly important for farmers to grow more crops more efficiently. That’s where potash fertilizers come into play — they not only increase the quality of food being grown, but also increase crop yields. Farmers use various fertilizers to grow crops, but the two most common are sulfate of potash (SOP) and muriate of potash (MOP). For investors interested in the potash space, it’s important to know the difference between these two types of potash fertilizers. Read on for an explanation of their common uses, as well as a look at methods of producing them and which companies are doing so today. MOP, or potassium chloride, is the most commonly used potash fertilizer and can be used to farm a variety of foods, particularly chloride-loving vegetables like sugar beets, celery, Swiss chard and other plants that are resilient to chloride. Its chloride content can be beneficial for soils that are low in chloride, making them more disease resistant. There are some drawbacks to this kind of potash fertilizer. For example, if high levels of chloride are present in the soil or irrigation water is being used to grow crops, adding MOP can create toxicity. That means levels of the fertilizer have to be carefully managed, and MOP must only be used for select crops. Still, MOP remains the most popular potash fertilizer, with over 55 million tonnes being sold and used annually. Having said that, the popularity of MOP in recent years has led to production that outpaces demand, resulting in lower-than-desired prices for the product. The market got moderately better in 2018, but is still a long way away from its peak in 2009. Nutrien (TSX:NTR,NYSE:NTR), a company formed by the merger between Potash Corporation of Saskatchewan and Agrium, is a major producer of MOP, and because the fertilizer is so crucial in the world today, many smaller companies are also exploring for the material. For example, Highfield Resources (ASX:HFR) is a MOP exploration company that currently has five potash projects in Spain. It continues to advance its Muga potash project, and said in its latest project update that it expects the mine to have a 27-year lifespan, producing 1,000,000 tonnes per annum with an EBITDA of around 300 million euros per year once it reaches full production. Saskatchewan-based Western Potash, a subsidiary of Western Resources (TSX:WRX), is pursuing MOP as well at its Milestone project. Gensource Potash (TSXV:GSP), which is also based in Saskatchewan and focused on MOP, has established a joint venture with an Indian conglomerate to develop the Vanguard One project — a small, scalable potash production facility in Central Saskatchewan. Companies like Encanto Potash (TSXV:EPO), Verde Agritech (TSX:NPK) and Karnalyte Resources (TSX:KRN) are all also involved in exploration for MOP. SOP is considered a premium-quality potash. It contains two key nutrients for growing crops: potassium and sulfur. Using SOP not only improves quality and crop yields, but also makes plants more resilient to drought, frost, insects and even disease. SOP has also been known to improve the look and taste of foods and can improve a plant’s ability to absorb essential nutrients like phosphorus and iron. Most often SOP is used on high-value crops like fruits, vegetables, nuts, tea, coffee and tobacco. The fertilizer works better on crops that are sensitive to chloride, which can sometimes have a toxic impact on fruit and vegetable plants. SOP is not a naturally occurring mineral, and usually must be produced through chemical methods. Because of the resource-intensive processes used to create it, SOP is priced higher than MOP. The most common method used to produce SOP is called the Mannheim process. It involves pouring raw materials into a muffle furnace that is heated above 600 degrees Celsius, creating a reaction between potassium chloride and sulfuric acid. It accounts for roughly 50 to 60 percent of global SOP supply. The next most common way to produce this type of potash fertilizer, accounting for about 25 to 30 percent of supply, is by reacting potassium chloride with various sulfate salts to form what is called a double salt. “The most common raw material employed for this purpose is sodium sulfate. Sodium sulfate, either in the form of mirabilite (also known as Glauber’s Salt) or sulfate brine, is treated with brine saturated with MOP to produce glaserite,” explains Kalium Lakes (ASX:KLL) on its website. “The glaserite is separated and treated with fresh MOP brine, decomposing into potassium sulfate and sodium chloride,” it continues. There are also operations that produce this type of potash fertilizer by using salt mixtures from natural brines. This requires brine with high sulfate levels, typically found in salt lakes. Companies able to use naturally occurring brines include Compass Minerals International (NYSE:CMP), which operates out of Overland Park in Kansas, and Chile’s SQM (NYSE:SQM), which has operations in the Salar de Atacama. Aside from those miners, there are also smaller potash fertilizer companies that eventually plan to produce SOP. Those include Agrimin (ASX:AMN), Crystal Peak Minerals (TSXV:CPM), Danakali (ASX:DNK), SOPerior Fertilizer (TSX:SOP), Reward Minerals (ASX:RWD) and Salt Lake Potash (ASX:SO4). Reward Minerals’ Lake Disappointment project is the largest brine-hosted SOP deposit in the world. Which type of potash fertilizer company would you invest in and why? Tell us below. All companies listed in this article had market caps of over $5 million as of December 30, 2018. If you think we missed a company that should be included, please let us know in the comments. And don’t forget to follow us @INN_Resource for real-time updates! You missed one… Agrimin (ASX:AMN). Possibly the greatest SOP project under development anywhere in the world. Check it out. Thanks for the company recommendation! We’ve added it to our article. Pingback: What's the Difference Between Potash and Phosphate? 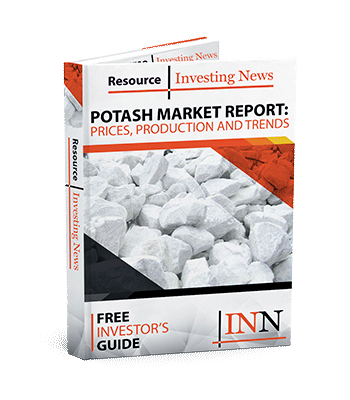 Pingback: What is Potash Investing?